Yesterday our gorgeous but not so clever spoodle ran out the gate onto the road in front of our house, and yours truly did what came instinctively and tried to run after him to keep him safe. Not a good idea one week on from spraining my ankle, and judging by the very sharp pain I felt then and since, it was not my most clever moment. So I am back to sitting down resting today. Always a silver lining, got to do some scrapping. 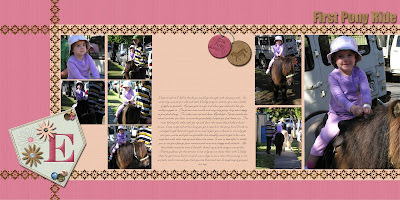 Our school fete is coming up and we were talking about the pony rides last year and how much my daughter enjoyed them. I decided to get the photos out to scrap. As always I was a bit indecisive, played with a couple of things until it was how I liked it. I am hoping that the lovely, wonderful, kind and generous Pam (enough grovelling ?) will do some Skip pockets (HINT HINT HINT), like the amazing ones she did for Run (you know the “undies” ones LOL). So I made a temporary one whilst I wait for the next skip elements instalment. Anything I made (with the exception of the temporary pocket) is included in the download. 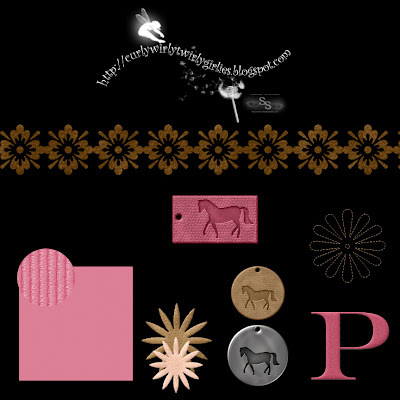 I did pink corduroy paper, a stitched daisy, some felt cut out border strips, leather (yes groan leather again LOL) pony tags , felt flowers and a monogram P. The leather horse tag is in two versions and a pewter because the pewter and the first tag didn’t feel right (but I didn’t delete them), and the buttons and stitches/knots are all from previous freebies I have given out. Grab them Here whilst I add the journaling to my layout. For those with boys, I will be doing a horsey one next for my son’s first pony ride so stand by for some in the run colours. I can’t get over how much she has changed in a year. Sob, whimper, my baby’s growing up too fast. Erika with one fat colourful ankle ! Update - I changed the layout. I put my daughter's monogram because the P for Pony Rides was not working for a title and I added the felt title at the top. super stuff erika! i have pony pictures to scrap for ds and dd both. you are coming up with wonderful goodies!!! ty ty ty! What great add ons. Thanks so much. I love your layout! Thanks for the freebies. I can't wait to use them. Great layout! The pocket looks terrific!